I'm sitting in one of the back rooms of the Hotel Guadalquivir pub/restaurant trying to get caught up. 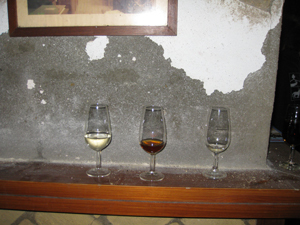 It's almost 10:30pm, just got back from the ride briefing and awards ceremony - it was held in an old bodega, La Gritana, where they have been making Manzanilla - Sherry - for a century at least. Huge old 'cave' in the middle of the city of Sanlucar Barrameda - the city at the mouth of the Guadalquivir River where it empties into the Atlantic. The riders left from the Virgin Church in El Rocio at 7am - still pretty dark - but they were led out of town by the organizers and various ATV's and Rhinos and support vehicles. It was cloudy and it stayed too dark for photos pretty well into the morning. We wound though the outskirts of town, aroused a few pastures of sleeping horses - one group followed us for a while, led by a gray which glowed in the semi dark forest. Nice. We entered the Donana Preserve again (one of the largest National Forest preserves in Europe) and started picking up the sandy trails and roads. The forest was in various stages - tall trees, medium, small - different stages of management. I asked Antonio about the shape of the trees - they only have the high limbs, the trunks are tall and curving and very elegant. Antonio told me that they keep the trees limbed like this because the summers get very hot, and wild fires are not uncommon - and the trees don't burn because the combustible needles are so high off the ground. Makes sense. beautiful too. 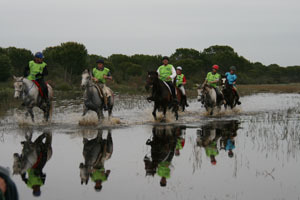 We had a little more daylight as the riders approached the beach - it was really wet and swampy in places that had been dry and dusty when I rode it 2 years ago. Flowing creeks, small lakes - lagos - that we had to drive around, the horses sloshed through them since the footing was still firm and sandy. And then to the beach, la playa, for the next 25 miles. Amazing. A few miles along the beach and then the vet check. The afternoon was mile after mile of incredible beach. They started the ride so early this morning so that it would be low tide for the riders - long stretches of firm sand along the waves. After the vetcheck which was held on the beach below a village, we entered the preserve again. Pristine (for Europe) beach, dunes, controlled access. Soto obtained special permission to bring the ride through here, along with the support vehicles. The only other souls we saw were fishermen. It stayed gray and stormy all afternoon - a spit of rain for a few minutes, but that was the worst of it. 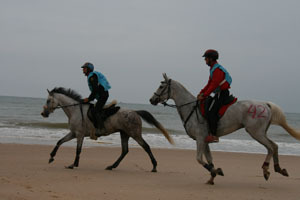 By the time we got to the finish outside of Sanlucar de Barrameda the sun was starting to break though in spots. The horses and support rigs had to be ferried across the bay - the mouth of the Guadalquivir River - deep channels for commercial ships, strong wind, the ferry was swept sideways as it crossed the open water. For a few hours it made trip after trip across the bay with horses and rigs. It was an amazing - and tiring - afternoon - cool, windy - stopping all along the way for photos. The camera crew was a riot! they really worked hard and I'm not sure how they'll ever sort through all the incredible footage of horses galloping along the beach, crossing the dunes, chasing up huge flocks of gulls, splashing through the shallow waves. It was hard work for the horses though - many of them looked quite tired at the finish. So many miles of sand, the third day for some of them. And I think some went pretty fast for the first couple of days. The real challenge is to finish all 8 days on the same horse. Tomorrow the terrain changes. We'll drive to a staging area an hour and half outside of Sanlucar, and start there. The trail will now start climbing into the mountains. 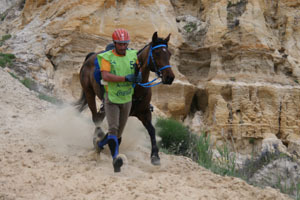 Tomorrow we'll finish in Ronda (a very old spectacular city - with some original Roman structures still in place).